Obviously you can't ignore the irony involved wherein a movie that preaches against using digital effects in museums verses authentic exhibits ends up employing cutting edge digital technology to enhance nearly every frame of this Museum's 105 minute running time. However, when the finished product is this unexpectedly entertaining an exception must be made. 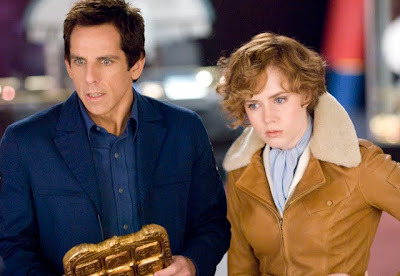 Despite its ingenious premise of the original film about a museum security guard Larry Daley (Ben Stiller) who discovers that the exhibits come to life when the doors to the public close, the first Night at the Museum never used the opportunity to develop the creative potential to its fullest. Sadly, instead of running with it the way that we know Ben Stiller, Ricky Gervais, Owen Wilson, Steve Coogan and Robin Williams can, it was treated like a one-joke gimmick that was lathered, rinsed, and repeated until ultimately it just fell flat. 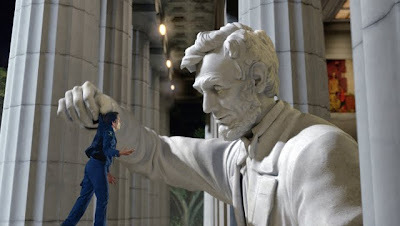 And despite the fact that as of today, Night at the Museum has a higher fresh rating on Rotten Tomatoes than its Smithsonian counterpart, overall I felt the first Night grew into an increasingly unfunny movie that escalated into a violently disappointing live action version of a Tom and Jerry or Woody Woodpecker and Wile E. Coyote cartoon which found Ben Stiller moving from one chase scene to the next. While in fact, the frantic pace and overall chase has extended in its imaginative sequel, in my view, this time around the result feels infinitely fresher and ironically because of its superlative CGI, which was the Achilles Heel for other major studio ventures like G.I. Joe: The Rise of the Cobra, Transformers: Revenge of the Fallen, Watchmen and Terminator Salvation. Similarly impressive for avoiding 2009's other popular family fare gimmick of 3D altogether, this Museum is far more admirable for offering us a PG rated adventure that entire families can enjoy together. However, some critics were annoyed that Museum plays fast and loose with the facts by only giving us a snapshot of some of the exhibits/personalities in one-dimensional dialogue as evidenced in Bill Hader's General Custer for example. Yet, it's another issue that must be forgiven since the most important thing to remember is that the first Museum inspired children to visit actual museums. Therefore, the films encourage further exploration by keeping things moving instead of giving us the Ken Burns style history lesson which would bore its target demographic completely and turn them off on the idea of museum patronage. And by changing its main location to the legendary exhibits and historical artifacts of Washington D.C. primarily via the group of museums that make up the extraordinary Smithsonian, viewers are finally treated to the ideal blend of humor and CGI action that has Bedtime Stories with Adam Sandler as well as Robert Rodriguez's Shorts. Although needless to say the sensational effects make Fox's Blu-ray the ideal format to sharpen the theatrical experience even more at home since it most likely didn't screen near you in digital projection, a good part of the film's success is due to its enviable cast. While sometimes comedic dream teams and superstar lineups crash harder than the odd pairings and out-of-touch jokes at awards shows, this time it feels much closer to touching the improvisational spirit of an admittedly minor Christopher Guest movie than some crass comedies made for the Judd Apatow demographic. And intriguingly for a franchise film, Ben Stiller's Larry Daley may be the main character but it's generous with its comedy, allowing all to contribute, riff when they're feeling it, in a way that frequently sets up Stiller as the straight man to everyone else as the rest of the cast takes turns becoming the overall star. 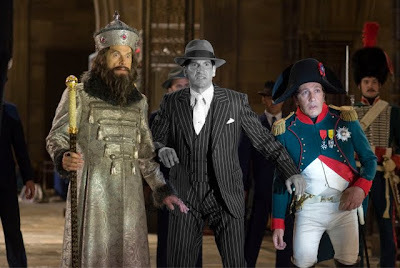 Great evidence of Stiller's flexibility in playing it straight can be seen in his encounter with overzealous guard Jonah Hill. 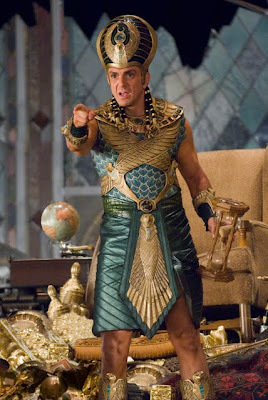 Obviously it's a blast to see Hank Azaria (in one of three roles) play an evil pharaoh who sounds like Family Guy's Stewie Griffin given a light lisp critique Darth Vader and play off Christopher Guest but it's particularly delightful to watch actors one wouldn't suspect join the group. Still most notably of interest is Amy Adams who continues to amaze, deftly moving from dramatic work in Sunshine Cleaning and Doubt to a breezy comedic sensibility in Miss Pettigrew Lives for a Day and Enchanted. With her blue "peepers" flashing brighter than ever, she makes a bold decision to play Amelia Earhart by channeling screwball comediennes of the 1930s and 1940s. Watching her here reminded me of seeing her live before Junebug happened and back when she appeared as a featured star in musical comedies at Chanhassen Dinner Theatres in Minnesota with a great confidence, command of her character and creative contributions. One of those great female comedic roles that makes you wish an entire film could've been built around her character, Adams delivers lines faster than Earhart flew planes. With an infectious sense of innocence and joy, her energy in the film calls to mind Rosalind Russell in His Girl Friday, Katherine Hepburn in Bringing Up Baby and The Philadelphia Story, Claudette Colbert in It Happened One Night and The Palm Beach Story, Irene Dunne in The Awful Truth, and Carole Lombard in My Man Godfrey. Seeing her volley back and forth with Ben Stiller in an extended version of that foreplay pep-talk she gave to Will Ferrell in Talladega Nights: The Ballad of Ricky Bobby is great fun and is multiplied to more irresistible effect when the two meander into paintings and photographs (a nice touch), encounter a chatty Lincoln at the Memorial, and dish about Pi with Einstein bobbleheads. 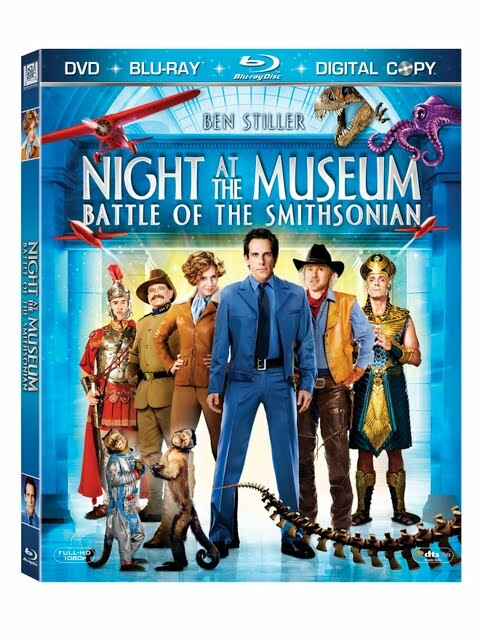 Contrary to their fear that Ben Stiller and engaging director Shawn Levy couldn't surpass the original movie, Night at the Museum: Battle of the Smithsonian completely changed my mind about the franchise with a surprisingly charming and highly entertaining summer comedy I'd originally avoided at the multiplex. And once again, I was thrilled to discover I was wrong and admit in this case the error of my first impression with Night. 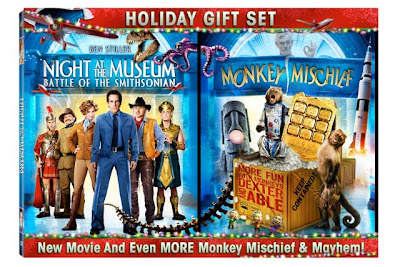 Filled with extras that are delivered in a 2-pack DVD version with a limited time disc titled Monkey Mischief, Fox's Blu-ray rivals Disney's Combo Packs with several worthwhile featurettes in a 3-disc budget friendly edition that includes the film in three formats including Blu-ray, DVD as well as a Digital Copy. FTC Disclosure: I spent this Night at the Museum with the critical standard review copy of the work from 20th Century Fox to accurately reflect the edition I was evaluating. Receipt of the title had no bearing on my review, as contrary to my belief that I assumed I would dislike the film, I was delighted to discover that this is one Museum that I enjoyed quite a bit and would visit again not just on a critical field trip.